There are a lot of Spanish singles with translated titles on the sleeve - Bobby Goldsboro's Autumn of my life is an example - but when a sleeve announced 'canta en espanol', you can be sure that the artist has re-recorded their song in Spanish. 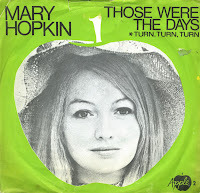 Mary Hopkin did this with her 1968 hit single Those were the days. 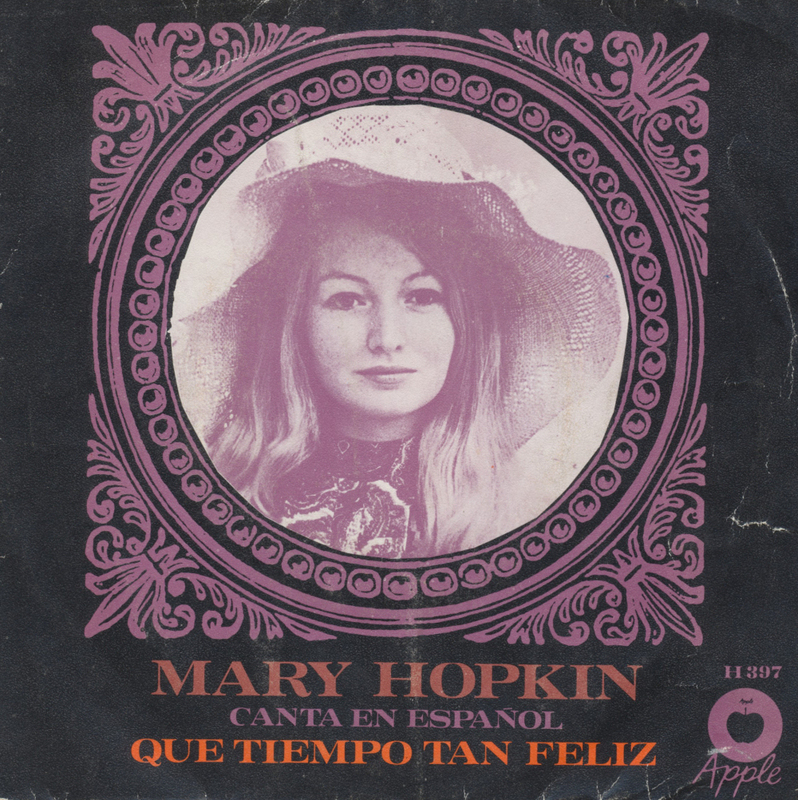 I couldn't pass up on 'Que tiempo tan feliz', because the original is so beautiful and it would be interesting to hear it in a different language. All I need now is the Japanese version of The Police's 'De do do do de da da da'. Although I already have a 7" single with 'Those were the days' on it, I couldn't pass up on the opportunity to buy this original edition from 1968, made in the UK and released as the second single on the Apple label. The B-side of this single is a folky version of the song 'Turn, turn turn', a hit for the Byrds in 1965. 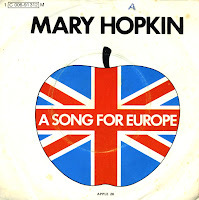 Mary Hopkin represented the United Kingdom in the 1970 Eurovision Song Contest singing 'Knock Knock, Who's There?'. Despite being the pre-contest favourite, Hopkin came second to 'All Kinds of Everything', performed by Irish singer Dana. The singer expresses a long-held optimism at the prospect of love finally finding her. At the exact point that said optimism has faded, and she has resigned herself to not finding love and companionship, she hears a 'knock knock', which signifies love finally becoming attainable for her. Excited, she beckons love to 'come inside' and into her life. "Knock Knock, Who's There?" was released as a single on 23 March 1970, reaching number 2 again in the UK singles chart. In the Netherlands, the single peaked at number 3. This single features two hits by Mary Hopkin. She was born on May 3, 1950. She started her music career as a folk singer in a Welsh local group called the Selby Set and Mary. After her appearance in the BBC talent show 'Opportunity knocks' she was recommended by model Twiggy to Paul McCartney, who signed her to the Beatles' Apple label. Her debut single, 'Those Were the Days', produced by McCartney, was released in the UK in 1968 and went on to become a number1 hit. on 30 August 1968. The 1969 single 'Goodbye' reached number 2 in the UK. It's funny that her chart performance was just the opposite in the Netherlands, with 'Goodbye' reaching number 1 and 'Those were the days' peaking at number 2.